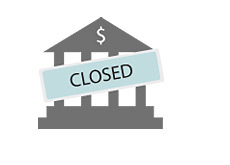 Two smallish banks were shut down this week, bringing the total of failed banks in 2010 up to 127. The FDIC (Federal Deposit Insurance Corp.) announced earlier today that they had taken over Haven Trust Bank Florida (Florida) and North County Bank (Washington). Haven Trust Bank Florida had approximately $148.6 million in assets and $133.6 million in deposits, while North County Bank had $288.8 million in assets and $276.1 million in deposits at the time of failure. The two failures are expected to cost the FDIC's deposit insurance fund a little over $100 million combined. Florida has been one of the hardest hit areas in terms of bank failures, as a total of 24 banks have failed in the state during the first nine months of the year. How does the 127 failed banks (so far) in 2010 stack up to numbers from previous years? As you can see, the number of failed banks in the US has been accelerating since the start of the "Great Recession" in December of 2007. The number of failed banks in 2010 is expected to end up topping last year's total of 140. That being said, many experts predict a decline in the years ahead.